I'm a big fan of over-the-air (OTA) digital TV. It is free and there is plenty of high definition (HD) content. I think it is the highest quality content available other than a Blu-ray disc. OTA certainly beats Comcast Cable TV's signal. I had been using a small indoor antenna to receive all my OTA content. It worked well when all the local stations were broadcasting in the UHF band. 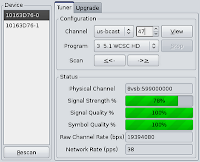 However, our local PBS station, SC ETV WITV, switched from UHF to VHF early in 2009 (reasons revealed at the end of this post). I could no longer pick up their 3 stations with my small indoor antenna. I was missing my PBS shows so I decided to purchase an outdoor antenna from Lowes. I wasn't thrilled with the prospect of seeing an antenna on my roof so I installed it in my attic instead. The hardest part of the install was fishing the coaxial cable from the attic through the wall into my wiring closet. In my wiring closet I have the coax connected to a splitter connecting to both capture devices on my HD Homerun. The HD Homerun is connected to my LAN. I have the two capture devices configured in my MythTV backend so all my MythTV frontends can enjoy OTA content. Sweet! It has worked out really well. The reception is great and the antenna it is protected from the wind and rain. Below are my screen scrapes of my signal results on my HD Homerun unit. Note that the Signal Quality is the most important property. According to AntennaWeb.org more stations may switch from UHF to VHF after the digital transition is complete. So, if you have been getting by using a small UHF antenna you may want to look into purchasing an outdoor VHF antenna. Here is the response I received when asking why SCETV switched from UHF to VHF. It takes less than one tenth the transmission power to cover the same area on VHF as it does on UHF. With state budget cuts and corresponding layoffs recently, we're obliged to save money every place we can. Moving to channel 7 will save us nearly $5,000 per month in electrical costs at the Charleston station alone. Likewise, at Charleston, we were leasing a port on a common antenna used by three stations at $15,000 per month. So the combination will total $20,000 per month savings of tax dollars. On analog, we covered from the ocean to Lake Marion on channel 7 and from Myrtle Beach to Beaufort. The only difference now is that we have a digital signal on channel 7 instead of an analog signal on channel 7 using the same broadcast antenna. The coverage is the same, but you do need an antenna that performs well on VHF. This post was helpful. I was wondering why I dont pick up ETV! Do you think there is anyway I can get VHF with an indoor antenna? This post has been helpful. I was wondering why I don't pick up ETV! Do you think there is anyway I can pick up ETV with an indoor antenna?